After a brutal attack on Christian worshippers on Sunday 22 November in Attagara, Hassan was running back home holding his ‘Children’s Bible’ when three Islamic insurgents grabbed him and sat him down. According to an eye witness, one of the insurgents wanted to take the Children’s Bible from Hassan’s hand but the little boy refused. 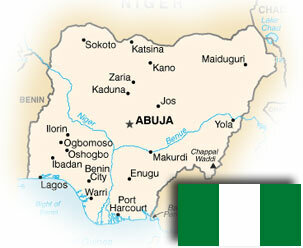 The Muslim insurgent snatched the Bible by force and threw it into a nearby burning fire. Hassan ran to where the fire was to rescue his Bible. The heartless Muslim left Hassan and walked away. Hassan survived the attack but was badly burned (scroll down to view image of Hassan). On behalf of Hassan and others like him who have suffered at the hands of Boko Haram, cry out to the Lord to bring justice to an unjust world; ask Him to protect and preserve His people (Psalm 140). Pray the Lord will bless this young child with a strong faith, endurance and an unquenchable desire to love and serve the Lord all his life. Pray the Lord will completely heal this young child, in the name of our Lord Jesus Christ. Are these Evangelicals deceived by their own good relationships and what they have seen by government officials? Are these Evangelicals bought and paid for by the state government or self interested political figures? What would make or drive an Evangelical to be used this way when over 1000 people, principally Indigenas actually personally affected marched and expressed their pain in front of the government offices? Would they have the courage to present themselves and face those brothers in Christ that they have betrayed by denying them, as Christ was denied by Peter? How many times in the past have they denied their brethren? What type of government would prefer to lie and manipulate Evangelical leaders than actually do what needs to be done to resolve the active cases, and change the system so that religious tolerance could actually take place? What type of government advises its functionaries not to respond to a march of 1000 peaceful and humble people with real grievances of neglect, sabotaging their cases, and accusing them of protecting their own vested interests? What type of government tells people that there were only 300 marchers that were there, and doesn’t let their own Secretary of State or the Governor know what is happening? What type of governor allows his cabinet and functionaries to do what they wish without accountability? Where were the rest of the Body of Christ, while some of their leaders marched with the persecuted church? Where were the rest of the Pastors and leaders of the Evangelical community? Why in the capital of the state do people not know that there are 70 cases of religious persecution and over 1400 people affected, not all Indigenas, but also various mestizo (Mexican) congregations expelled or persecuted? (Yashtinin and Matamoros to name 2). The group from Buena Vista, waiting more than 3 years for a resolution other than packing up and allowing themselves to be re-located, is planting itself in the park in front of the government offices. They have already had several services with preaching and worship there! Pastor Josue, leader of one of the largest denominations in the state, returned to spend the night, encouraging them throughout the night. Other groups are stopping by to visit them, some bringing blankets, sweaters, cooked food, and also to leave them with words of encouragment. Other affected groups are scheduling days or nights to spend with the Buena Vista group… because they are becoming one, as they are meant to be, despite language and cultural differences between one group and another. How is it that the state government has for so long and so badly underestimated the endurance and strength of the humble Evangelicals, even when their leadership betrays them? How is it that the state government preferred and decided to divide and conquer, by offering commissions, benefits, money, material possesions and political positions to Evangelicals , and thought they could always depend on following this same pattern of corruption and abuse? How is it that the government functionaries haven’t realized that their neglect of duty, favoritism, and corruption will someday come to an end, and they will be judged both here and later on by a judge who can not be deceived or bought and paid for? How is it that Evangelical leaders do not fear the Lord, who sees their actions, and knows their hearts? People passing by are reading the banners, asking questions, and beginning to read the Bible with them. Several government officials have stopped by to convince them to pick up and go home, trusting the government to do it’s job. The persecuted no longer trust their government, nor it’s officials, with the exception of a few. The Religious affairs office, and the regional directors are pretty much discredited in their eyes, for their personal experience dealing with them for at least several years. If the state government is not up to it’s job, then they are willing to take their testimonies to a national and international level. They now know in their hearts that their trust is in the Lord… not in any government official or agency. They are drawing closer together, being strenghthened as a body, growing in their faith. Please continue to lift them in prayer… several will be testifying in Mexico City next week, in a national forum about religious persecution in Chiapas, and others on an international level. They continue to lift in prayer those who have persecuted them, the government that has failed them, and one another. I invite you to join them in prayer and lift your voice to share their concerns and needs as you prepare to celebrate IDOP in your church this year. Jesus Freaks / Locos por Jesus Dramas: We will cut off your feet! 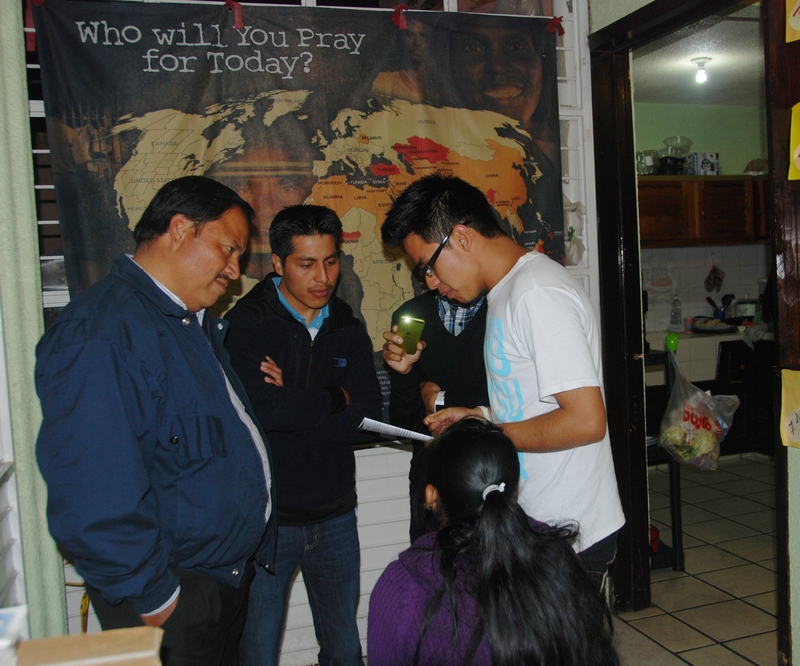 Youth from San Cristobal de las Casas church groups attended their first Locos por Jesus / Jesus Freaks meeting, and were presented with the task of presenting an improvised drama from the VOM Jesus Freaks book. This group, along with their pastor, took on the testimony of a youth who was threatened with having his feet cut off if he continued with his evangelizing efforts in the region. Each group was allowed to scavenge in the VOM Base looking for anything to use as part of their costumes or accesories. How did they do? We did’t have a bike to lend them, but otherwise they did fairly well. The youth in the story braved bad weather, difficult terrain, and the threats of muslim radicals that told him he would have to stop coming into their regions or they would stop him: by cutting off his feet! You will have to look it up in the book to see how it ended… Through enacting the drama, the youth involved and their pastor gained a better idea of what it must have been like for the young man who actually lived the experience in person. 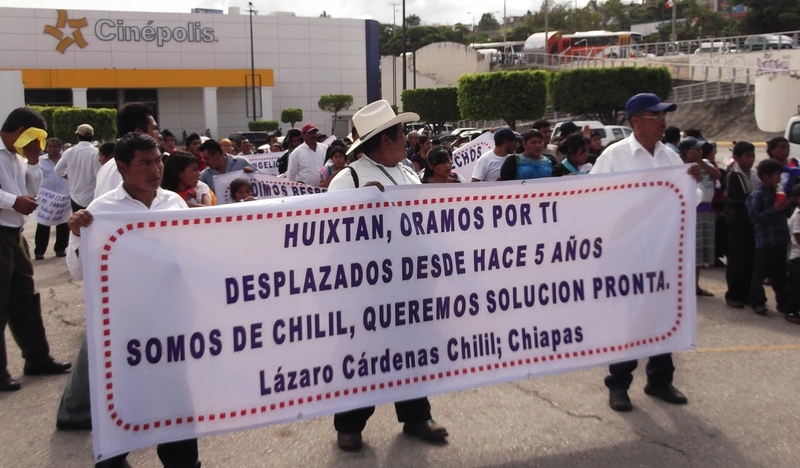 These young people probably have a better idea than most what it would be like since many of their parents or friends have been through similar experiences in Chiapas. For those who may have distanced themselves, and become comfortable where they are at, it was a lesson in not fogetting others who are persecuted for their faith. Dear Brother in Christ: Our office in Mexico was the first to inform the International VOM offices about the danger of drug cartel violence several years ago when no one anywhere wanted to listen. In the first presentation of the Director of Voice of the Martyrs in Mexico, October of 2008, the situation was specifically mentioned and we have discreetly mentioned the developing danger to evangelical believers and their pastors in varied Social Blogs, VOM Networks, Facebook, Twitter, etc. We have seen all of this coming for more than 20 years. We have received reports since 2009 of evangelists fleeing, ministries thinking about leaving Mexico, and the increase of extortions in several states. HOWEVER, in each case where we received information, we were asked not to publish their information, but to lift them in prayer. We actually have another Director in Chihuahua, who is fully aware of the situation, and lives it as part of his daily experience. Our interest has especially been in seeing the development of relations between the Mexican drug cartels and their Colombian connections… where hundreds of pastors, evangelists and believers have been killed for speaking out and continuing their labor in spite of the threats for years. Voice of the Martyrs publishes, encourages and reports not just people being threatened or in conflict… but those who no matter what the cost, follow and witness of Christ. You may contact the VOM USA office in Bartlesville Ok and ask them to send you the magazines touching on the situation in Colombia and reading about their manner of dealing with the threats. We have seen the situation grow, bit by bit over the past 20 years, because churches and pastors didn’t take seriously the threat that was facing them. Keeping quiet… hoping it would go away, because it was too uncomfortable and truly dangerous to face those who were corrupting their society. I myself have spoken out and done ministry in the nearby prison, not measuring my words… both of hope but also of conviction. I have neighbors who have been kidnapped, tortured, mutilated, and had their body parts strewn in different places. The first two young men decapitated in Mexico were young boys, neighbors when the Lord called me to Mexico. They also had heard the Gospel, but weren’t drawn to follow it. The locals, young men between 12- 18 in my old neighborhood rejected the Gospel we shared with them when they were small kids… and had been left by their parents to grow up in the street, becoming child drug pushers… and then some of them on to become brutal killers. In Mazatlan, many “good decent people” figured that the carnage would never reach them for being a tourist area… with even the municipal government publishing that tourism wouldn’t be affected by the violence… until now the daily carnage that even appears in broad daylight in the tourist “Golden Zone” is seen as part of everyday life. May the Lord watch over, guide, and protect the new mayor who has a heart for change and his people. A well known legal advisor to many of the Religious Associations and Ministries such as Evangelical Rehab Centers attacked in Chihuahua has published complaints and warnings to alert the Body of Christ and authorities because of his close relactionship with them and contacts in the government; also Oscar Moha, journalist / spokesman for the persecuted church in Mexico City has published articles regularly for years on the subject. We have not been given permission by any of our contacts to cite their cases. They quietly continue their work for the Lord, but with discretion. We see a correlation between the assault on the northern / Border states and the armed conflicts in Chiapas both related to drug / arms / and a power play to take control of or to exert political authority over the country itself. It now no longer appears to be a money oriented business… but focused on power and political control. Evangelicals or others with a strong Biblical value system do not fit in with the goals of these varied groups, be it Marxist Zapatista rebels, drug cartels, radical anarquists of whatever stripe. But the true church is salt and light in a dark and danngerous world. And we are meant to be just that. The danger you face in the northern and border states is understood by your brothers and sisters in North Korea, China, Pakistan, Egypt, Cuba, Colombia especially, Sudan, Somalia and all the others who are not tolerated for the faith and values they share at all costs. Forgive me, but what is probably the saddest point in the situation being faced in your area is that the church wasn’t prepared. Many of the churches have been blessed by their relations and support from churches and ministries in the USA… they have been the recipient of many blessings and ministry programs by those Americans who wanted to help in foreign missions and found it so practical and convenient sistering churches and ministries in Mexico close to the border. Hermanos en Cristo Mexicanos y Americanos colaborando a su lado… no son olvidados. Brothers and sisters in Christ… in the northern & border states and colaborating with them… you are not alone. 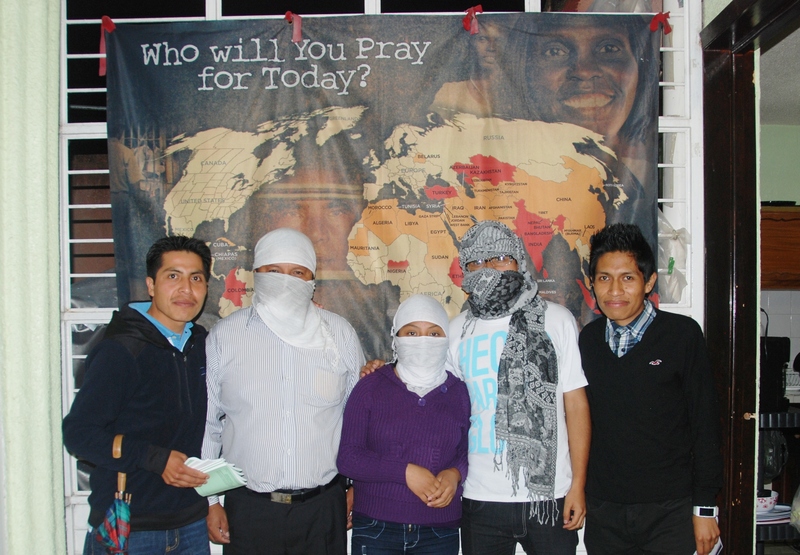 You are prayed for by Christians around the world and have been represented in the VOM Voces Mexicanas DVD that came out last September 2010, and in our reports… but for your safety we have tried to be discreet and not draw attention to your danger publically. Do not give up! Use the persecuted church testimonies as your example… your brothers and sisters in Christ around the world do whatever they can to keep the church alive and ministering in the worst of situations… The Lord is by your side, the same as He is with them. For those who speak Spanish… VOM Mexico is hoping to provide you also with the material that will encourage or guide you. You not only are not alone, nor forgotten. Please keep your brothers and sisters in prayer in the central and southern parts of Mexico. The violence is spreading and the masacres are now being reported all around the republic, with small children as collateral damage being killed. 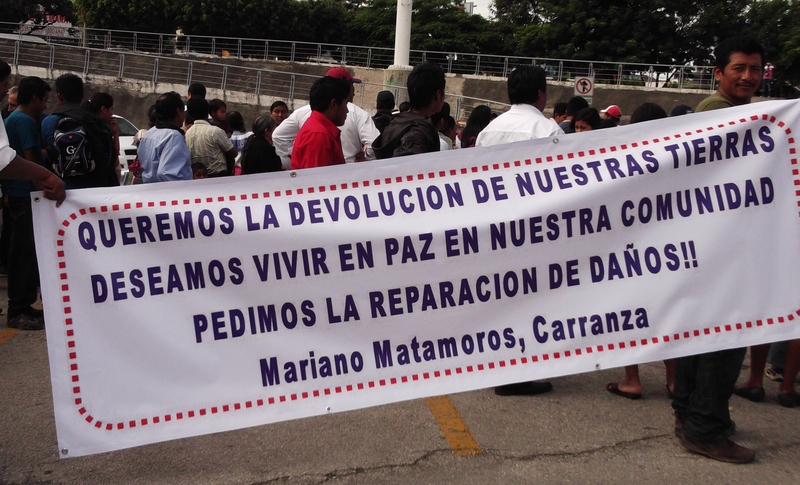 Also remember the Evangelical Heroes of the Faith in Chiapas, Oaxaca and Hidalgo… who have lived and exerienced the violence against them for decades… without the Body of Christ paying much attention to them for being Indigenas. The Zapatista Movement is not dead, but still very much alive and draws to it those who have always persecuted the evangelicals as carriers of a rival faith. There have been many reports published of dfferent groups collaborating with the various cartesl present in the southern states. Remembering that Greater is He who is us… Romans 8: Mas Que Vencedores / More Than Conquerors, in this you can put your trust, doing what He has called you to do, be what He has ennabled you to become… Reflection of Christ to others. Isabel from Oaxaca: while her husband Ruben worked 3 jobs for 8 years in the USA, building her a nice home, their son became sick, and was dying. The shamans and witchcraft could do nothing, nor the saints… but Jesus healed him. She can’t renounce her faith either… it gave her Salvation and her son’s life. She and 49 other families were expelled… loosing everything. Ruben came home to straighten her out… but found himself unwelcome too. He’s now trusting Jesus. Children are also victims: expelled from public schools, loosing govt benefits that bring food, milk and other aid into their homes. Estela: spokeswoman for the Innocent Prisoners from the Acteal Massacre Case from 1997… 86 arrested and falsely accused including almost half of them Christians that the Zapatistas wanted out of “their territory”. Erika, from Hidalgo… harassed and threatened in her community and her church besieged by neighbors so it can’t be used. Pastor Lucio: Chamula from Los Llanos… was a drunken addict until he met Christ in a Christian Rehab Center. On returning home he shared Christ with his family and neighbors, and led a small congregation. In short time he saw his church torn down, then their houses… and all 31 of them were run out loosing everything last January. They are displaced persons, in Chiapas Mexico. Antonio from Huixtan… was run out of his community as well in 2001. Now is studying in Ocosingo Bible Institute so he can share the Gospel as a missionary to those who oppose it. 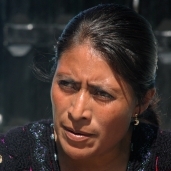 Petra, Chamula from Los Llanos: mother of eight minor children at 33 years of age. Was expelled with the rest of her congregation… has seen her husband saved from alcoholism and her family firmly established in the Lord. She is now a spokesperson for her people, one of the few who speak Spanish well. Lay Pastor Miguel with his Pastor: several communities were affected by a mob attack of 200 neighbors armed with machetes who came to cut their utilities because they weren’t participating in the Catholic festivals anymore, and paying fees for Catholic Traditionalist festivals. These are our brothers and sisters in Christ… my friends, some of my heroes. Please keep them in prayer along with the Presbyterian brothers who were attacked February 2010 leaving one widow, several orphans, and a number of them incapacitated and traumatized by the violence directed at them. We were advised tonight that Spokeswoman Estela Luna Perez’s father, Bartolo Luna was liberated from El Amate prison after serving 13 years of a 36 years sentence for the Acteal Massacre, on trumped up charges. On December 22nd, 1997, a group of Pro Zapatista sympathizers Las Abejas was attacked and 45 Tzotziles, mostly women and children were brutally killed. Almost 120 Tzotziles were rounded up in the following days when the pro Zapatistas started pointing fingers and identifying a long list of neighbors or Indigenas from surrounding areas who were not part of the movement, political party, or majority religion. 86 were convicted over the years, half of them evangelical believers who insisted they were innocent scapegoats in a plan to rid the highlands of political and religious opposition. The Christians were considered to be “throwaways”, and less likely able to provide a defence for themselves. The Mexican government on various levels was accused of facilitating the arrests and sentences to end the scandal quickly and hide any part or fault they may have had in planning the attack or in causing it by ignoring signs of unrest and violence growing in the area between groups. The prisoners familes ended up being more and more isolated, and ended up the last several years with little pastoral care.They invested much of their time in calling attention to the lot of their men, and maintaining the properties their men had left behind. In August of 2009, the Mexican Supreme Court ruled that the evidence used to convict the prisoners was manufactured, falsified, and that the process was full of human rights abuses. 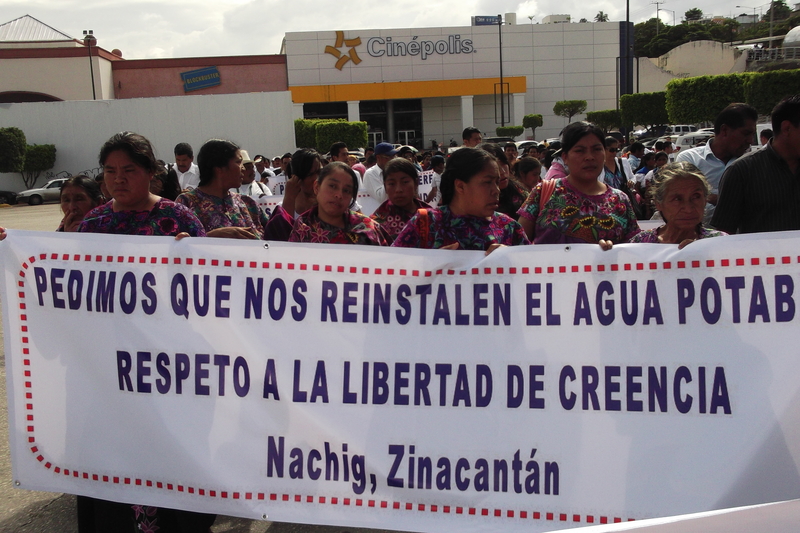 The survivors, the Zapatistas, and the Catholic Liberation Theology proponents in Chiapas have insisted that all the prisoners without exception were guilty and that only the government authors of the crime were still free.That would mean that if only one of the prisoners is innocent that the case against all of them is suspect. October: Jesus Freaks: Youth, Adolescents and University age with a heart committment to follow Christ no matter what the cost. Youth participating in the VOM Mexico Sunday School Teachers Training for those living in the environment of persecution in Chilil, Matamoros, Buena Vista, Union Juarez, and Nachig... Leaders of the Jesus Freak Group in SCLC, and the members of Missions School Mas The visit of Doug Steytler, Director of VOM South Africa to the VOM Mexico ASAP Base. Attendance of Director Linda Picard at the VOM ICA meetings in Oklahoma. The various Shadow of the Cross Workshops being offered in Mexico throughout the reainder of the year. IDOP combined with Shadow of the Cross Workshops in the next few months. For the meeting to be held with members of the Family Workshops in the conflict zone... for understanding, patience and good will towards each other.